These words, bronzed into the foundation of the Statue of Liberty have been a symbol of hope and freedom for nearly two centuries. And while this sentiment may or may not be widely held in contemporary America, there is no denying the liberal spirit in which the Statue was originally built. One of the most recognized landmarks in the world, the Statue has lent her visage to countless artists. And to each, the Statue’s true meaning has been a source of artistic expression for the individual and for popular culture. This larger-than-life landmark has, as a result, become one of the most popular icons in global recognizance. The complexity and the virtuosity in Her meaning ensure that she will remain one of the world’s most popular sources of artists’ inspiration. Below you will find some of the noteworthy examples of the ways in which the Statue of Liberty has impacted the world, as well as how different individuals have decided to portray these same concepts. 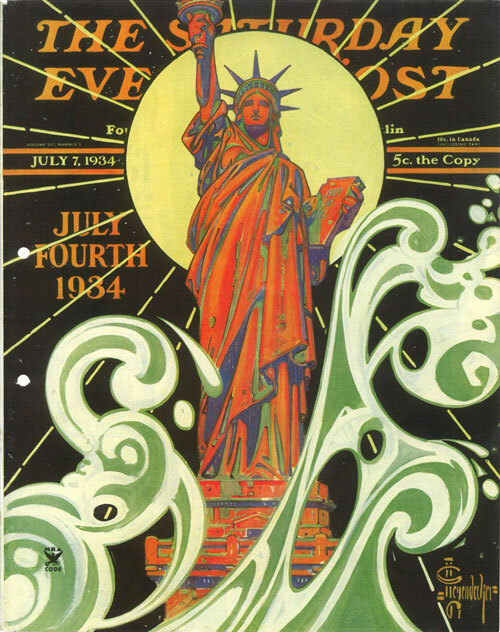 The Saturday Evening Post began circulation in August of 1821, and this particular issue was released after the fourth of July during the height of the depression. The artist of this piece was German Born American, J. C. Leyendecker, and his interpretation of the Statue of Liberty was iconic for the time. Leyendecker drew over 300 illustrations for the post that spanned over five decades. Interesting enough, Leyendecker was said to be Norman Rockwell’s main influence, and Rockwell was actually a pallbearer at Leyendecker’s funeral. Star Wars isn’t just for geeks and fanboys anymore, it’s for pop artists too. Animator and special effects designer, Wade Lageose created this interpretation of the Empire’s most feared icon for the Vader Project art exhibit. This exhibit was unveiled in 2007 at the Los Angeles Convention Center, for the 30th anniversary of the original release of Star Wars. 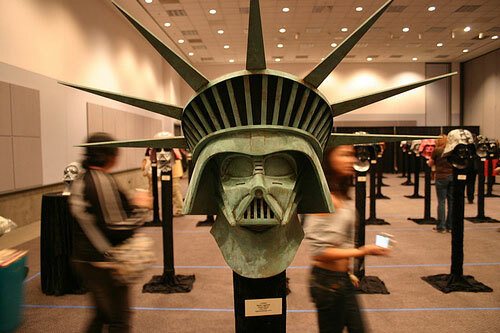 Some of the most influential underground and street artists were sent Darth Vader helmets to use as a canvas for this project. The resulting exhibit was a fanboy’s dream that included tributes to the dark sith lord, abstract interpretations, and anti-war sentiments. Artists included: Gary Baseman, Buff Monster, Mister Cartoon, Marc Ecko, Paul Frank, and Shag. 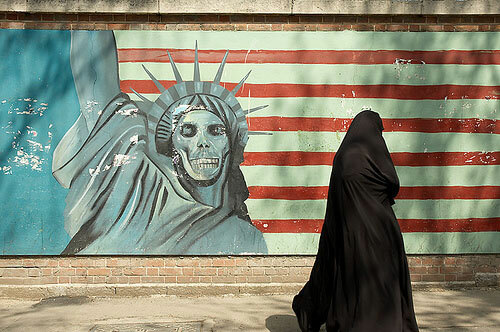 This picture was taken outside of the former US embassy on Taleghani Street in Tehran, Iran. Seemingly, this unknown artist is not doing an interpretation of the the famous Patrick Henry quote, “Give me liberty, or give me death,” although he may be doing a parody of it. Rather, one can assume that this artist is publicly dealing with the West’s mounting tensions with Iran. 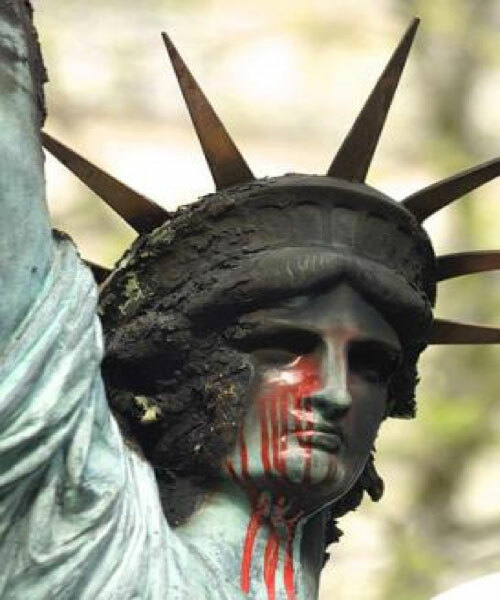 This piece seems to link liberty with death itself, being that Statue of Liberty’s face has been replace with that of the grim reaper. 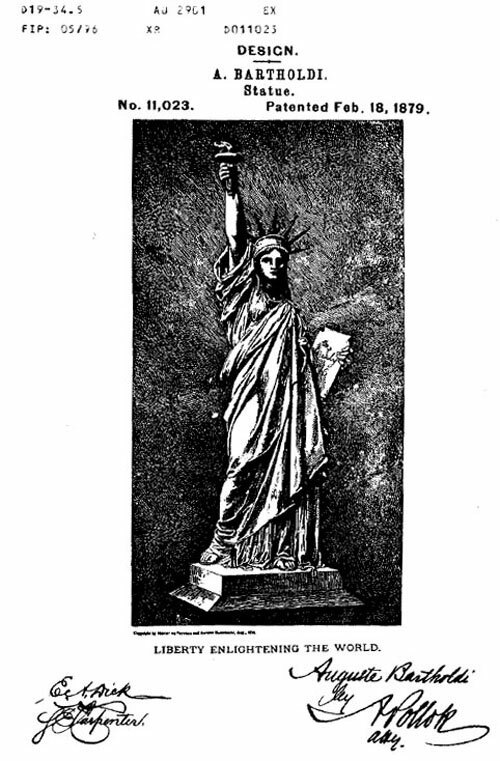 This piece is from the actual illustration found on the U.S. patent that was filed by Frenchman Frederic-Auguste Bartholdi, on January 2, 1870. According to Bartholdi, the American monument would be a colossal statue of a woman entitled “Liberty Enlightening the World.” Nearly 17 years after the application for the patent was submitted the Statue of liberty was complete and erect for the world to see. If you are interested in learning more on the details of this two decade long saga, please visit the source link below the picture. Artist Danny O., native to Lexington, Massachusetts, created this collage piece. His original artwork is known for its use of incorporating recycled materials from a range of media, such as comic books, magazine cut-outs, scotch tape drawings, vintage album covers, and old lottery tickets. 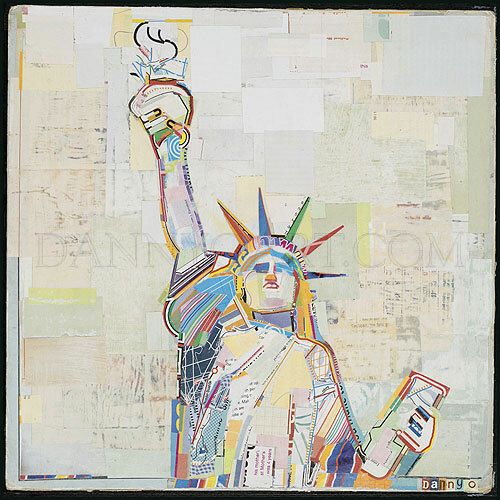 His interpretation of the Statue of Liberty is very playful and almost seems juvenile, but regardless, Danny O.’s artwork has hung in prestigious galleries and museums across the country. This picture was arranged and taken by Arthur S. Mole and John D Thomas at Camp Dodge, Iowa in the summer of 1918. 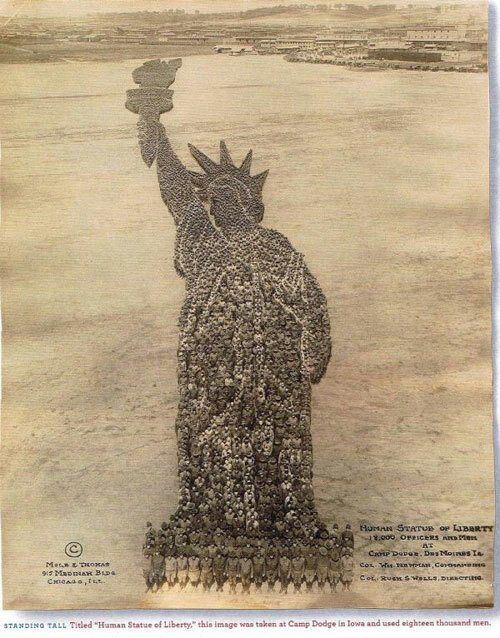 18,000 Iowa National Guardsman were used to create this quarter-mile tall interpretation of the Statue of Liberty. The purpose of this piece was to use it as war propaganda to sell war bonds during the First World War. 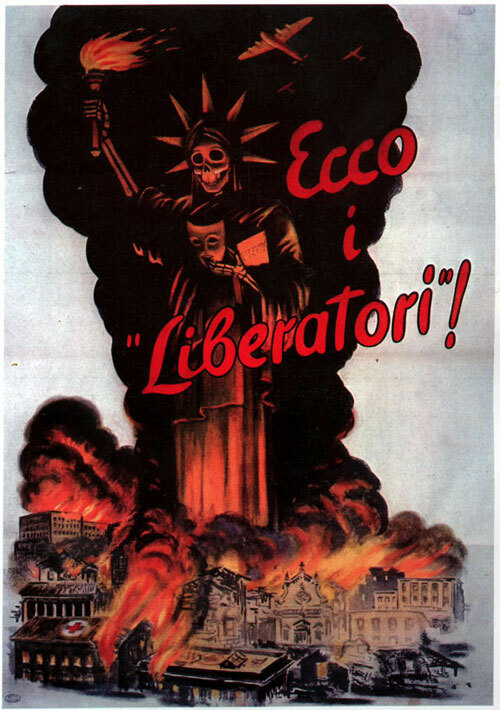 This Italian World War II propaganda poster reads “here are the liberators.” Once again the Statue of Liberty is portrayed here as an iconic figure of death. What is unique about this piece is that it seeks to point out the seeming hypocrisy of the Allied Forces. On one hand the Allied Forces represent liberty with one face, but on the other hand the real face of death and destruction is revealed behind the mask. This piece was created in 1986, and was one of Andy Warhol’s last. It is now part of the private collection of Mr. and Mrs. Graham Gund. 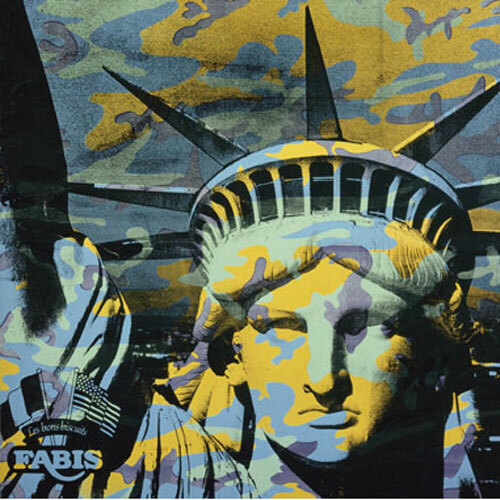 Last year, Warhol’s “Statue of Liberty” piece was displayed in public at the War and Discontent exhibit at the Museum of Fine Arts in Boston. Warhol’s work, of course, was known for its interpretation of popular icons to convey a message and his trademark use of acrylic and silkscreen ink on canvas. Banksy has unofficially become the spokesperson for a generation of young people who are fed up with the mainstream and status quo of our elected representatives. His inspiration and challenging pieces can be found all over the world. This one in particular can be found in London (if it hasnâ€™t already been painted over). Banksyâ€™s original pieces have sold at Sotheby’s for nearly £60,000 ($120,000). 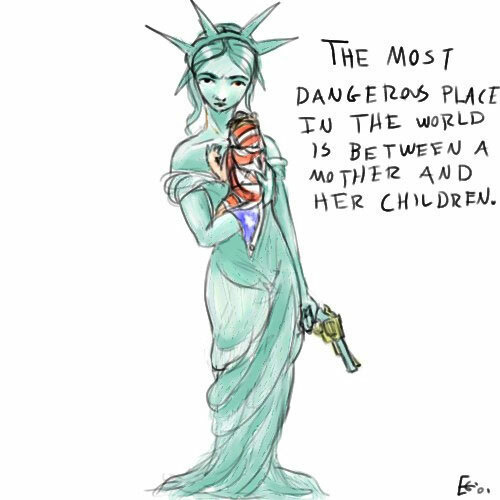 In the wake of the attacks on September 11, a seventeen year old by the name of Eliza Gauger sketched this piece called “Mommy Liberty” and posted it on her live journal page. Immediately the picture was sent all over the world via email, and it ended up being published in many newspapers all over the country as an editorial cartoon. Eliza was reported saying this pencil sketch was an illustration of what her own mother would do for her children if someone attempted to hurt them. 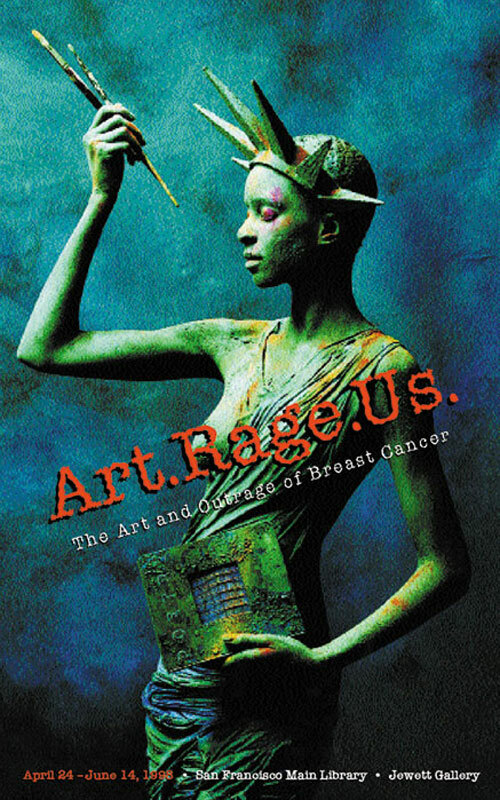 This photo was arranged and taken by Greg Sampson for the Breast Cancer Fund’s “Art.Rage.Us” Campaign. This piece graced the posters for a breast cancer inspired art exhibit at the San Francisco Library in 1998. 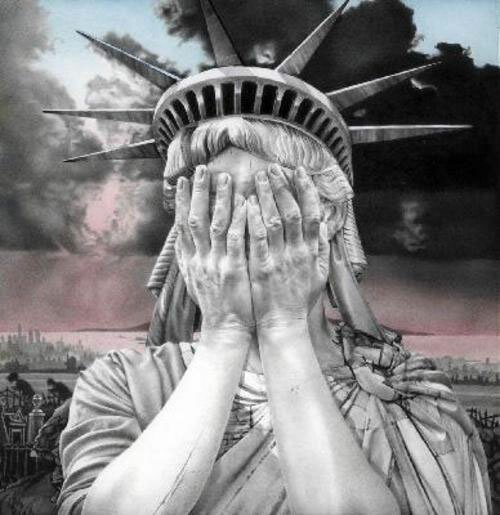 The description of this piece reads, ‘Visually arresting photography of the “Statue of Liberty” figure with a mastectomy illustrates America’s uneasy relationship with women artists and breast cancer’ but also represents the pride that these artists feel. Not much is known about this young artist except his name is Ryan and he is a toddler. 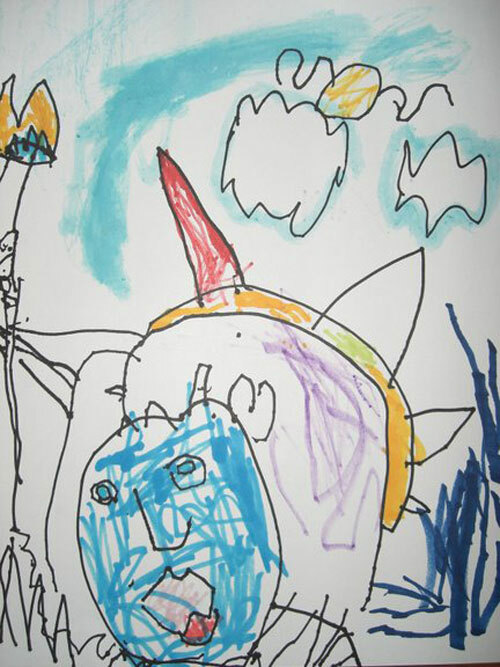 Regardless of his age, his willingness to illustrate a picture of the Statue of Liberty is inspirational. To know that the idea and icon of this statue inspired him in one of his weekly drawing activities is amazing. It is important to encourage young children to be creative, not only does this encourage growth in the young children, but it encourages adults in the same way. We can all learn a lot from the youngest in our communities. 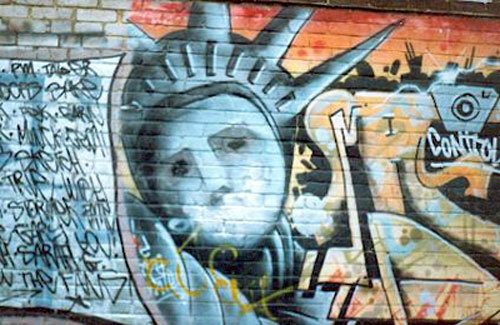 The caption for this photo reads, “The head of a replica of the Statue of Liberty is shown in Bordeaux, France, Wednesday March 26, 2003, after vandals set it on fire overnight Tuesday.” Even if this piece was the result of vandalism, it personally speaks volumes on what this current administration has done to the liberties Americans once enjoyed. 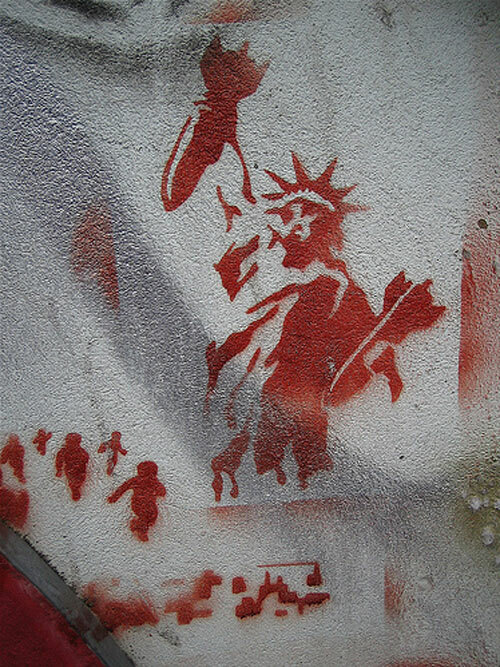 This stenciled piece is by an unknown street artist, and this photograph was taken on Brick Lane in London. Street artists in the UK have been using their unique form of propaganda to persuade their fellow Brits for years. Though it seems since the invasion of Iraq in 2003 the world has seen a surge of creative messages being put up all over the UK. Here the Statue of Liberty is seen throwing Bombs at a crowd of people running away, one can’t help but see the parallels between this piece and the Italian propaganda poster from WWII. Gee Vaucher is best known for the remarkable graphics she produced for British punk rock acts in the late 70’s and early 80’s. Her works have always been socially conscious depictions of upsetting political realities. This painting is no exception. She uses simple tools to produce her works such as paper, pencil and water based gouache paint. Simplistic, real, and telling, Vaucher’s works are set to influence and inspire young artists for generations to come.